Wright State University offers a Bachelor of Fine Arts (B.F.A.) degree in Dance that prepares students to become versatile professional dancers, choreographers, and teachers – by integrating rigorous training and performance experience in ballet, jazz, and modern dance, with acting and musical theatre studies. Our faculty and guest artists represent all facets of professional dance and do all they can to help students prepare for success. Dance majors hone their technical abilities and creativity through daily ballet classes and specialized training in modern and jazz/theatre dance, perform in dance concerts and musical theatre productions, and create and produce their own choreography. Our most exceptional students experience the life of a professional dancer from the start when selected for scholarships that provide performance opportunities with our partner companies Dayton Ballet and the Dayton Contemporary Dance Company. 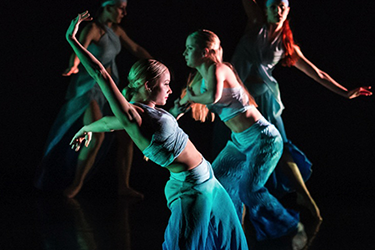 Dance majors perform regularly on and off campus, including dance ensemble productions, studio concerts, dramatic and musical theatre productions, as well as works choreographed by fellow students. Our alumni are currently performing with leading dance troupes nationwide. For more than 40 years, Wright State University’s B.F.A. 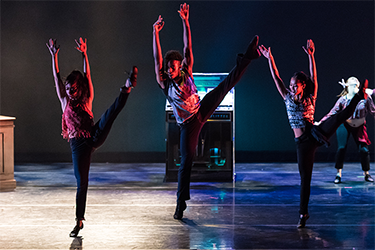 Dance Program has prepared students to begin professional careers in modern, ballet and jazz dance companies, on Broadway, in commercial dance venues, and theatres around the world. Let us help you follow your dream. Wright State’s professional dance training nurtures each student to attain artistry, technique, and versatility as a dancer, in preparation for careers in dance performance, musical theatre, choreography, and teaching. The Dance program uniquely fuses theatrical and musical training into the dance curriculum, enabling dance students to prepare for specialized careers in modern and ballet companies or in the professional theatre as dancers who sing and act. 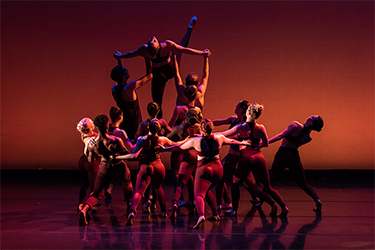 Today, our alumni are performing in companies and venues around the world, including the Luna Negra Dance Theatre, Dayton Contemporary Dance Company, Rockettes at Radio City Music Hall, Battleworks, Forces of Nature, Wylliams/Henry Contemporary Dance Company, BalletMet, Ballet Noir, Hirabayashi Dance Theatre, and Disney World, as well as on cruise ships, national tours, and Broadway. Wright State performing arts grads find career success performing on cruise ships. The dance majors will attend Dwight Rhoden’s two-week “intensive” in Los Angeles tuition-free. The underpinning of the Dance curriculum is the daily ballet class, coupled with specialized training in modern and jazz/theatre dance. The Dance program also encompasses dance history, dance pedagogy, improvisation, choreography, tap, pointe, men's class, and pas de deux. To enhance their performance, dancers train in acting to develop the internal responses that support the external, physical movement of dance. All dancers take one full year of acting in which they explore various skills and methods of acting. The overlapping of dance with acting allows the students to develop both disciplines in an effort to produce an educated, artistic, and versatile individual. The accomplished, artistic dancer requires knowledge of and appreciation for music aesthetics. Dancers study basic music theory, including time and key signatures, note values, rhythm, phrasing, and dynamics. Dance majors take two years of private voice lessons along with a variety of music courses in jazz music, popular musical theatre, introduction to music theory, and music in the western culture. View the Bachelor of Fine Arts in Dance program information, degree requirements, and graduation planning strategy in the University Catalog. To remain in the Dance program, students must demonstrate continual growth as judged by the Dance faculty, maintain a 2.5-grade point average in all dance courses, and maintain a 2.0 overall grade point average. Juries are given at the end of each semester for freshmen, sophomores, and juniors. Seniors have a final jury at the end of their fall semester. Students must earn a positive recommendation from the Dance faculty before they can enroll for the next level of training. Seniors are required to complete a senior choreographic project before graduation, for which they create and produce an original choreographed work and a support paper. Students are responsible for all facets of the choreographed work, including casting, rehearsal schedules, costuming, and staging. The support paper contains a detailed discussion of the choreographic process, an analysis of the production elements, and recommendations for upcoming seniors. Each senior project is performed in February on the main stage. The Dance program at Wright State University is designed for students who are highly motivated to pursue professional careers in dance. Students must demonstrate dance proficiency through an audition and meet the university’s educational standards for undergraduate admission. The Dance program is unique in its multidisciplinary emphasis that integrates dance training with acting and musical theatre studies. Schedule an audition by completing and submitting the B.F.A. Admission and Scholarship Application (PDF). Submit photographs and a dance resume no later than two weeks before the audition. Submit a DVD of excerpts from a typical dance class at least two weeks before the audition, to be considered for performance scholarships with the Dayton Ballet or the Dayton Contemporary Dance Company. See the admission and scholarship application for the details. Admission to the Dance program is competitive and dependent upon the results of the audition. Auditions, which are required for all first-year and transfer students, are held each year in the winter for students who want to be considered for admission in the fall semester. Please see the department calendar for the audition schedule or refer to the B.F.A. Admission and Scholarship Application (PDF). The audition consists of an interview with the Dance faculty and a ballet barre followed by learning a short combination from each discipline: ballet, jazz, and modern dance. Students who wish to audition for performance opportunities with Dayton Ballet and the Dayton Contemporary Dance Company must submit a DVD of their dance class work two weeks before the audition. The audition also serves to determine qualification for scholarships. Call (937) 775-3792 if you have any questions. Tickets required and will be sold beginning February, 2019, at the Wright State box office. Artists with Complexions Contemporary Ballet will teach master classes for dance students at Wright State, then perform in concert Sept. 28 at the Victoria Theatre. The Department of Theatre, Dance, and Motion Pictures has established exchange programs with the Dayton Ballet and with the Dayton Contemporary Dance Company (DCDC), which provide high-level professional training and performance opportunities for exceptional dance majors. Selected dance students may serve as apprentices or full company members in Dayton Ballet II or DCDC II; perform with their main companies in town or on tour; and attend master classes, workshops, and lectures conducted by their directors, dancers, and other professionals. In addition, our programs have had major collaborations with regional professional organizations, such as the Dayton Philharmonic at the new Benjamin and Marian Schuster Center, a state-of-the-art facility in downtown Dayton. All Wright State dance majors who are accepted into Dayton Ballet II or DCDC II are eligible for scholarships from the Department of Theatre, Dance, and Motion Pictures, Jeraldyne's School of Dance, or the Dayton Ballet School. Several former Dayton Ballet II/DCDC II dancers are now apprentices or full members of Dayton Ballet and DCDC. In addition, Wright State Dance faculty members have choreographed for Dayton Ballet and DCDC. Through our affiliations with other leading arts organizations in the Dayton region, our students also have opportunities to perform in professional theatrical and operatic productions.